In my last blog, I wrote Part 1 on the holistic approach to prevent or fight Canine cancer. I mention I gathered years of research from other vets and compiled it for you. A quick recap of part 1 is that the most popular suggestion is to reduce your pet’s toxic exposure. One of the several suggestions was changing to non-toxic cleaning. It also covered healthier pet products and alternative options. If you didn’t get a chance to read Part 1, I encourage you to do so now! In part 2, I will cover food, spices, and herbs that will prevent and fight cancer. The “foods” below have many benefits but I will list a few that are the most relevant to this topic. In researching the world’s oldest pets, I found a few things they had in common. One dog in Australia, who lived to approximately 30 years old, walked daily for approximately 5.5 miles or 9 kilometers, had fresh food and self-fasted. Another dog who was about 27 years old was a vegan. Finally, the world’s oldest cats also ate fresh food with veggies and got plenty of exercise. I have only fasted my dog if he has an upset belly. Knowing this gave me something to consider since I already make his food and ensure he gets daily exercise. 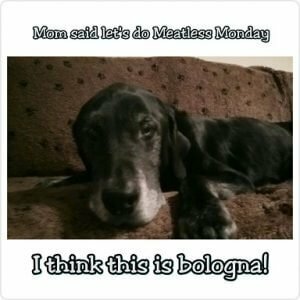 Recently I tried “Meatless Monday” with him. I joked with some friends that he wasn’t happy about it by making <—– this meme. Your pets’ nutrition will be of the utmost importance. If you want something pre-made, my dog likes this raw food or this food. Another option is a homemade diet that contains foods known to be anti-cancerous and anti-inflammatory WITH the guidance of a vet or dog nutritionist to ensure you are not missing critical components to making a balanced food. 1) Turmeric: Turmeric root can be grated, bought as a herbal remedy specifically for pets, dog supplement or found in a powder form in the spice aisle. Turmeric myth: A trend started claiming oil or pepper needs to be included with turmeric in order for it to be absorbed. I don’t believe that to be true. In the several products listed above, they do not contain these ingredients. Also many studies have been done on humans and neither oil or pepper was included. Turmeric Warning: I do have a few minor warnings. The 1st warning is to start slow, by using a small amount of turmeric spice. This helps “test” to see if s/he will eat it and if there is any sort of reaction. Go too fast and your dog could vomit. The 2nd warning is the spice stains your hands if you get it on you. It does come off after a few washes so overall no big deal. 3rd, but not least, if your pet is on medications, be sure to check with your veterinarian for any interactions. Turmeric Benefits for dogs: It is anti-inflammatory, anti-bacterial, antiseptic and has anti-cancer properties that have been known to help inhibit many types of cancers such as colon, stomach, lung, liver and pancreatic cancer. Also, it inhibits cysts, tumors, lipomas, and acts as a pain reliever. If your dog runs “hot” turmeric is not the best idea for your dog because it is will contribute to warmth. If you want to use something for inflammation, Violet would be better as it helps regulate body temperature. <— I learned that in the Herbalism class I’m taking. (see badge image at the bottom). Turmeric dosage for dogs: If you’re buying the above herbal remedy or the dog supplement, each include several items suggested in this blog and the dosage is included on the bottles. If you are using the spice, it will be 1/8 teaspoon per 10 pounds. For example, a 60-pound dog would get 3/4 tsp per day. Remember to start slow to get your dog a chance to adjust. 2) Garlic: This is something I have seen debated in the pet community for many years. 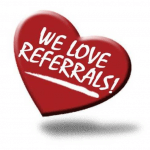 In a nutshell, some feel that small amounts are beneficial. Over the last year out of curiosity, I have started reading labels when I pass by pets foods and noticed it is in some pet foods. Garlic benefits: It is anti-bacterial, anti-viral, anti-cancerous and it’s supposed to help repel fleas. If your dog has an enlarged spleen, back pain or UTI’s, this may be beneficial for them as well. 3) Parsley: An herb that makes the body more alkaline and therefore it is helpful in preventing and/or battling all types of cancer especially multiple myeloma. It also helps with Arthritis, Addison’s, tooth decay, eyesight and more. This organic dog supplement contains several herbs and spices listed here. BONUS: If you have you used several of his holistic dog products and are seeing good results, you can enter to win a monthly contest to win free products. 4) Ginger: When I think of ginger, my mind used to always goes to ginger ale. Ginger works because it is an antispasmodic which helps calm an upset tummy. It is a member of the turmeric family and therefore has been reported in studies to help fight cancer. 5) Essiac tea: One vet referred to this as herbal chemotherapy. I personally know of a friend who gave this to her dog. The vet only gave him like a month or two to live and she had about a year with him. To purchase essiac tea for pets, send her an email. If you prefer a herbal supplement, this remedy has all the same ingredients except it has Organic Chinese rhubarb vs. Turkish rhubarb. 6) Chaga: It can be purchased as a powder that can either be mixed in food or brewed as a tea. Tip: I did not like it straight in the water, I steep it in this. Chaga benefits: helps bring the liver out of stagnation, helps skin issues like eczema, nerve pain, strengthens red blood cells and bone marrow. It is considered anti-cancerous and fights tumors. 1) Sweet potatoes: They are an anti-cancerous food and promote a healthy environment in your stomach and colon. If your dog is experiencing anxiousness or trouble sleeping, sweet potatoes may help them too. 2) Zucchini: They contain phytonutrients important for prostate health and are beneficial for stomach and colon cancers. 3) Pumpkin: Phytonutrients in pumpkin have been shown to help prevent the risk of cancers. Particularly mouth, lung, and colon cancer. Pure pumpkin puree, not the pie filling, can also help your dog if s/he is constipated or has diarrhea. 1) Berries: Raspberries, strawberries, and blackberries are great options. However, if I had to only pick one berry it would be Wild blueberries. 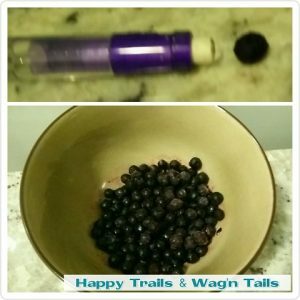 Wild blueberries are found in the frozen food section and are about the size of a pencil eraser. Don’t confuse them with the berries you find in a clamshell in the produce section. If you can’t find them, this powder is another option. Wild blueberries benefits: fight all types of cancer and have a high amount of antioxidants. Fruit should be fed separately from protein. Either one hour before protein or two hours after. I tend to use them as “snacks” or a treat. 2) Kale: Helps prevent cancer, joint issues and pushes out ear wax. 1) Spirulina: It comes in various forms such as capsules and powder. My understanding is it is best absorbed in the powder form. I mix it with coconut water to increase the effectiveness but also make it more palatable. Not all supplements are created equal, here is the specific spirulina I use and give to my dog. If you prefer a dog specific spirulina, I recommend this one which is formulated by a holistic vet. Improves gastrointestinal health: A strong gut = stronger immune system! Pulls heavy metals, such as mercury, out of the body. Mercury can fuel cancer and disorients eyesight and eye response. 🐱: I recently learned, from a holistic vet, that cats can have spirulina too! 2) Cats Claw: An herb that fights cancer, IBS, helps with weakness in limbs and joint pain. This remedy includes turmeric, cancer-fighting spice listed above, as well as a few other beneficial ingredients! Looking for a product but don’t see it listed here? Check out my pet products page for other recommendations.